No surprise, the tile industry is visual. It's also a natural for visual social networks such as Instagram. 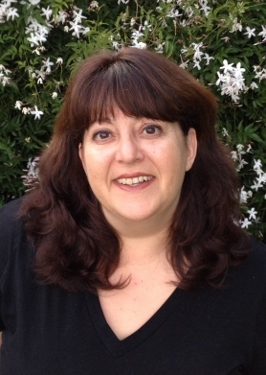 Last year at Coverings, we discussed Houzz and Pinterest. This year, we've expanded the conversation to include Instagram, in a session titled Online Visual Success With Houzz, Instagram & Pinterest. In preparation, I caught up with Arpi to specifically discuss Instagram. Wondering about Instagram and Tile? Here's what expert Arpi Nalbandian says. C.B. : Arpi, what do you love and hate about Instagram? A.N. : Instagram is one of those apps where you love it so much that one tends to overlook some of its less-than-optimal qualities. The fact that you can essentially connect globally with people still boggles the mind. Yet, it has become the norm to interact with and become friends with people you have never met. The same can be said of other apps and platforms; however, Instagram feels more intimate in a manner that cannot be duplicated by Twitter, Facebook or LinkedIn, for example. Through Instagram, the visual experience has become more personal for both your followers and those whom you are following. On the opposite spectrum are things I’m not fond of, such as the recent news of changes to Instagram. In essence, Instagram will place the photos and videos it thinks you will want to see from the people you follow toward the top of your feed, regardless of the time those posts were originally shared. Basically, Instagram’s feed will be similar to Facebook’s feed. No one is happy about this announcement. On the positive side, the addition of being able to toggle between multiple Instagram accounts is a Godsend. Instagram did step up for those who manage multiple accounts. I would also like to see them implement a native regram (re-posting) feature, as well as the ability to add live links to your posts. C.B. : Which apps do you use with Instagram? Which ones have you tried, and dumped? A.N. : The only app I have used, and continue to use, is IFTTT. This app allows you to cross-post effortlessly across the social media platforms you use. Currently, I have it set up where my Instagram posts go directly to Twitter complete with the image and link redirected back to Tileometry’s Instagram account. I found that after testing several variations, I preferred this method rather than auto-posting to Facebook. Hootsuite recently made it possible to schedule Instagram posts as well. I find it clunky but good for the times you know you’ll be unavailable to do it yourself. C.B. : How critical is it to use photo editing tools? A.N. : It depends on the user’s preference. Personally, I don’t use filters but I will crop images as needed. Also, I will occasionally use PicCollage while at an event or tile/stone show to quickly combine multiple tile images from a single manufacturer. On my laptop, I will use PicMonkey to assemble hi-res images into one cohesive frame. C.B. : How does Instagram fit into your business and your social networking diet? How does that compare to how you use Pinterest and Houzz? A.N. : For my personal business model, Instagram allows me to share tile designs and products with a wider, varied audience than I would normally connect with on Tileometry’s Pinterest or Houzz accounts. Also, by getting the attention of popular or community-based accounts (#IDCdesigners and #designhounds, for example), the one image can be seen by their followers, and hopefully, regrammed (re-posted) for additional visibility. Lastly, just as writers and editors need to be diligent with copyrighted material and plagiarism, the same rule applies to image-based platforms. I’m very careful to give proper attribution, and I will take the time to see where the image originated. If everything checks out, then I will use it. If not, I will move on. On Instagram, when I regram an image, I will not only give credit to the person who posted it, but after doing some fact-finding, credit the designer and/or manufacturer. The same applies to Houzz and Pinterest images. Always check the links to make sure they are not only current, but they do in fact go to the intended website. The popularity of Instagram offers a higher response, viral rate. Let’s face it, each year or two, a new platform comes along that we must all be on. Right now, Instagram is enjoying the limelight that Pinterest and Houzz did in prior years. 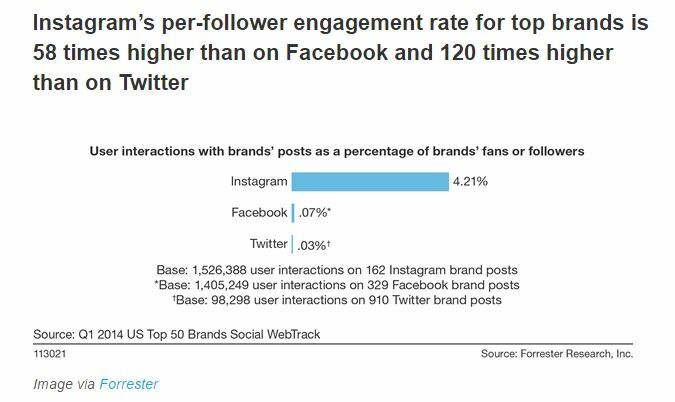 In fact, according to Social Media Today (Brand Audiences on Instagram Growing at Twice the Rate of Other Platforms [Report]), Instagram is growing twice as fast as other platforms. C.B. : Where do you find your Instagram inspiration? A.N. : Everywhere! I can be at a tile show, in Santa Barbara, in Spain, in a restaurant… it doesn’t matter. When your business is tile-centric, whether you like it or not, the first thing you notice is the tile in your surroundings. The wonderful part is that inspiration is not only underfoot, it can be on the walls, ceilings, facades, and more. Inspiration also comes from scrolling through the accounts I follow, or doing a search with one of many hashtags I use. For example, I may be searching the #kitchendesign hashtag and happen upon an image where the focus is on the lighting, yet my eyes are drawn to the backsplash or floor. Everyone has their own perspective. Mine happens to be tile. 7. 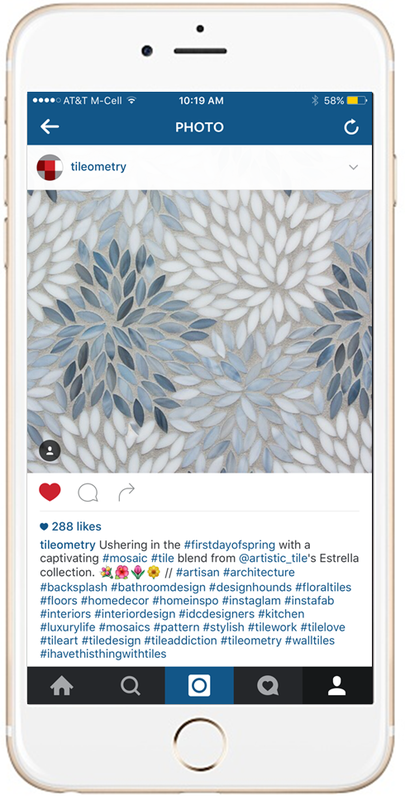 What have been your biggest surprises on Instagram for tile and flooring? A.N. : The number of tile lovers on Instagram who aren’t necessarily part of the industry blows me away! From a photographer in Paris who takes pictures of the beautiful cement tile floors in and around the city, to a businesswoman who captures the floors along her travels, and so on. It’s all so inspirational! 8. Which are your favorite hashtags and accounts to follow on Instagram? C.B. : What’s your advice for using hashtags on Instagram? A.N. : They’re a necessity on Instagram otherwise only those who follow you will see what you’re posting. Cast a wide but relevant net with your hashtags to attract fresh eyes. Did one of your installers complete a project? Then post it using hashtags such as #remodel #renovation #tilework #tiled #tileinstaller. You can also tag the distributor and/or manufacturer in the photo to get extra mileage from your post. Crossville (@crossvilleinc) is great at posting and regramming images from their clients, distributors and designers. C.B. : Advice for someone new to Instagram? A.N. : Don’t be afraid to explore and try something new by checking out other tile- or stone-related accounts. You’ll see recommendations from Instagram as you start to follow people, as well as additional suggestions in the “Explore Posts” section. Further, as you begin to post consistently, you’ll notice your followers will increase. A word of advice: posting more than once a day may be considered spammish to new and potential followers. However, if you’re sharing your tile discoveries from an event, such as Coverings, then go ahead and post away! Just make sure to tag the event (@Coveringsshow / #coverings2016), as well as the manufacturer, distributor, and so on. Also, make sure to add the Instagram icon to your website, blog, and especially your social media accounts (Facebook, Twitter, etc.)! It should go unsaid, but please respond to valid comments/concerns on your posts. What’s valid? A designer asking about a tile’s quality and usage, or a client asking for assistance. Conversely, someone asking you to follow them to get 5,000 free followers is invalid. Above all, represent you and what your brand stands for! You are your brand’s ambassador! Have fun, get inspired by others, and by all means, be patient. In time, you’ll find that what works best for you and your brand comes about with the tried-and-true trial and error method. Lastly, if you attend Coverings 2016 in Chicago, make sure to join Christine and me for our presentation, Online Visual Success with Houzz, Instagram and Pinterest ‒ 10:45 AM - 12:15 PM in the Social Media Lounge (Booth 4031). We’ll have more information, as well tips and tricks for successfully promoting your business on these visual platforms! Hope to see you all there! C.B. : Thanks very much, Arpi! We both look forward to seeing you at Coverings and discussing Instagram in more detail! In the meantime, be sure to let us know in the comments of any questions you have not to mention which #hashtags and Instagrammers you recommend following for perspective on the tile industry.